The Fusion 50 (36oz) pack was updated this year, but for a limited time you can purchase the first generation (the model I used above) at over 50% off with proceeds going to support one of the three long trails: Appalachian Trail, Pacific Crest Trail or Continental Divide Trail. I was excited to use this pack on the CDT, not only because it is smaller in volume than the other packs I have used on long trails and I would be forced to pack less, but also because it is the result of two experienced backpackers and pack makers coming together to create one hell of a great pack. Ron Moak (Six Moon Designs) and Brian Frankle (founder of ULA packs) worked on a pack to bridge the gap between the ultralight crowd and the average backpacker, a place I fall into on the spectrum of backpackers and the weight they carry. This pack actually came in a bit under 50 liters, but the space was sufficient to carry up to 7 liters of water and 8 days of food, and held up well when I had a pair of skis strapped to the pack. I often had all three exterior pocks maxed out, and despite one instance of shoving a waterbottle into an already maxed out side pocket and splitting a few of the seams (completely my fault), the construction was bomber and held up well to the trials and tribulations of a 5+ month hike. The pack comes with a metal stay which I ended up removing the first day of the hike (it’s malleable so it can be adjusted to each person individually) but even with that structural component gone the pack kept its shape and easily carried weights up to 5olbs (I never weighed the pack, but I’m guessing with skis, winter gear, water, and food in the San Juans it might have come to 50lbs). The hip belt comes with roomy pockets, and I was constantly surprised at what I could fit in there: sunscreen, snacks, sunglasses, compass, emergency beacon…the list goes on. The roll-top lid was simple and easy to use (and quite water resistant…although I usually had the pack lined with a compactor bag…no rain cover) and the articulated hip belt fit my hips very well as I lost weight over the duration of the trail. I never had to worry about this pack. It did the job and no matter how much weight I carried, was always comfortable. My sleeping pad is a good example of a piece of gear that was switched out multiple times during my hike. Due to a fire mishap with my alcohol stove, I burned up my Neo Air (9oz) mid-way through Colorado. 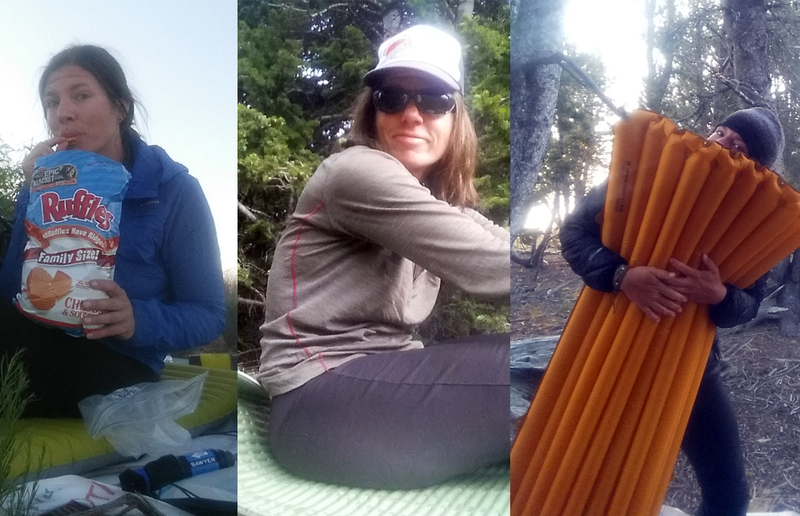 I hiked for a week with a flat sleeping pad before getting to Salida, CO where I purchased the lightest sleeping pad they had, the non-inflatable Ridgerest (14oz). There’s nothing quite like sleeping on air when in the backcountry, and while using the Ridgerest was more comfortable than rocks, I wanted to try another inflatable pad. I asked around and heard good things about the Gossamer Gear AirBeam (11.7oz), so in Leadore, ID received the new mattress. Neo Air: I had been using this sleeping pad for years on various hiking and packrafting trips. In addition to being the lightest option out of the three pads I used, I loved how small the pad packed down, and the short mattress doesn’t require 10 minutes to blow up, unlike the Neo Air long mattress I also use at home. 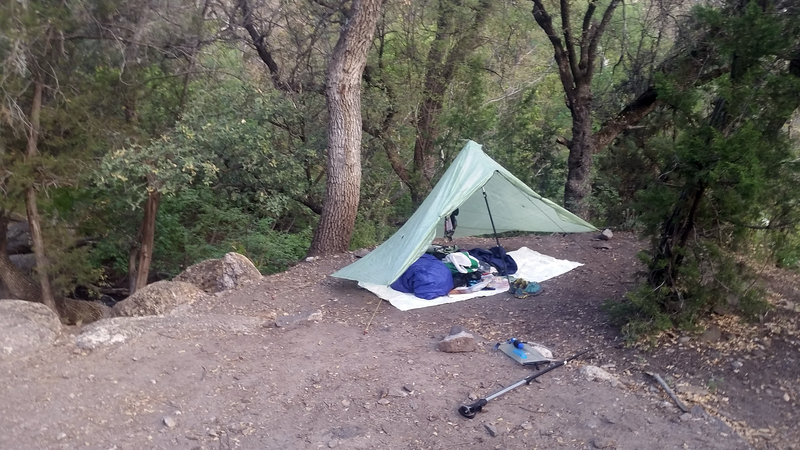 Because it was a short mattress I would put my pack under my feet to keep them off the ground and even though I camped near quite a few prickly and poky things in New Mexico, never got a hole. Even if I had, I was carrying small square bike patches which I found work well for fixing small holes in the mattress. I was super comfortable sleeping on this pad, and found it to be warm and well insulated from the ground no matter what the temperature. I camped on snow the first few nights in the San Juans, and the cold snow condensed the air in the pad during the night, causing me to wake up a few times to re-inflate, but overall this was an excellent option for a thru-hike and was worth spending an extra minute to make sure I wasn’t sleeping on anything pokey. 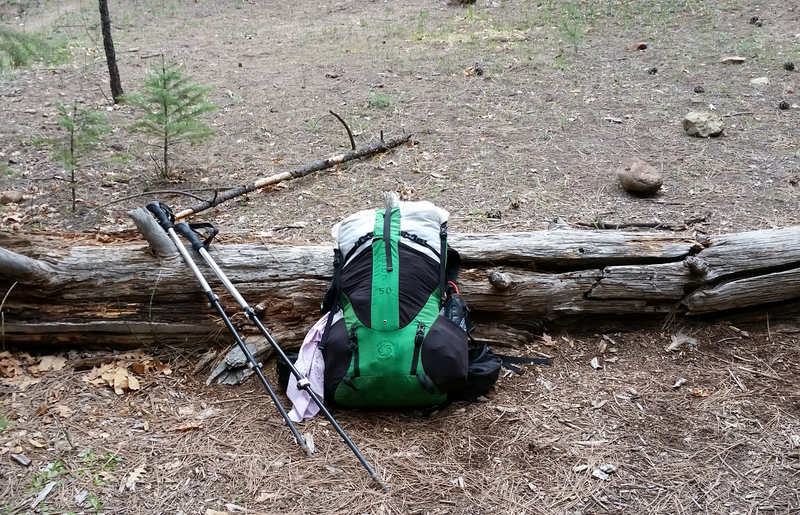 Ridgerest: I picked up the Ridgerest, and right off the bat loved being able to pull it out on breaks (I had it strapped to the outside of my pack) to sit on instead of my piece of tyvek which I normally used. Because it is a closed cell foam, it didn’t pack down at all, and could only really attach to the outside of the pack. In my opinion sleeping on one of these pads is only slightly better than sleeping right on the ground. It does insulate you a bit, and provides a smidgen of cushion, but it was a hard adjustment after sleeping on air the two months before my stove accident. If you are afraid of popping your mattress, and enjoy cushioned breaks, this might be the pad for you. Air Beam: I never measured the cushion of the Neo Air as compared to the Air Beam, but I seemed to float off the ground at least as much as with the Neo Air, perhaps even more. The long baffles seemed to inflate faster than the Neo Air, and the fabric used for this mattress also seemed a bit stouter. Because the baffles were deep on the pad, I would get sand and debris in between the folds, causing a hole that appeared at the end of the hike, but it was easily patchable with some tenacious tape. This pad was wider than the Neo Air…which was nice as I am a restless sleeper who can toss and turn during the night, and it was also short, so like with the Neo Air I would place my pack at my feet to insulate them from the ground. I noticed an incredible difference in the quality of my sleep after switching from the Ridgerest, and rarely had to blow the pad up during the night. Another great option for thru-hiking! A 7oz tarp??!!? Yep. And it kept me dry and cozy the 160 days I was on trail. A truly awesome product that doesn’t weight much at all. The set-up is similar to a mid design where one central pole (hiking pole) is the support for the shelter. The tarp has a zippered front vestibule, and depending on how it is pitched can provide varying degrees of protection. When windy or snowy I would secure the tarp close to the ground, this would keep wind and snow out of the sleeping area, but when fully secured against the ground my head and feet (I’m 5′ 8″) would sometimes brush up against the sides…only really an issue with heavy condensation. To mitigate condensation issues I would often use the accompanying guide lines to increase air flow and room under the tarp (like in photo above). With the guide lines I could set up differently depending on the terrain. Sometimes I would pitch the back flat to the ground and have the outer 2 corners at full extension…it really allowed for flexibility, especially when I didn’t spend much time picking a suitable campsite and had to make due. I added in two drying lines from the top of the tarp to attachment points on each side so I could hang socks and such after a long day. There was always plenty of head room in the tarp, and was much much roomier than my previous tarp, the GoLite Lair. You really can’t beat the weight though. This was an excellent shelter to carry on the CDT.